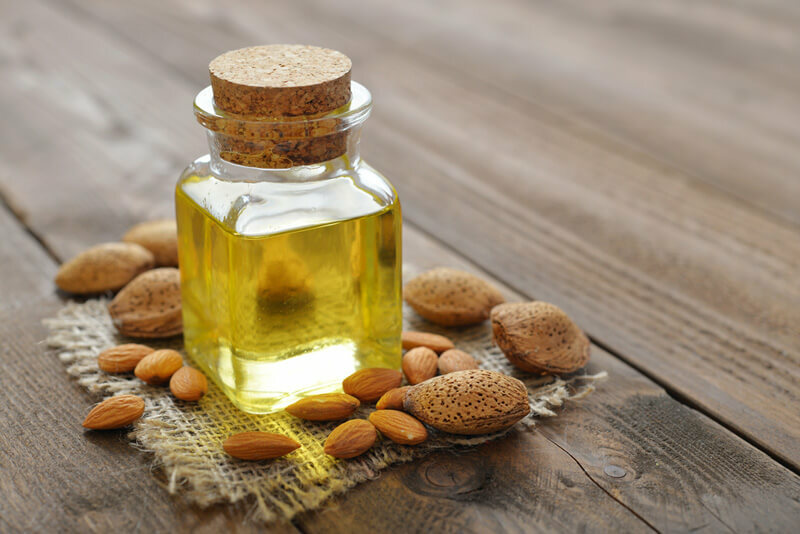 In this article, I’ll tell you about the latest research regarding the use of almond oil for hair growth, and how you can get started today using almond oil as a hair loss treatment. First, you’ll learn about almond oil, its origins, and its chemical makeup which contributes to its overall health benefits. Second, I’ll discuss the various scientific studies which show almond oil’s benefits and how effective it really is at treating hair loss. Almond oil also has high quantities of magnesium which in itself has been proven to promote hair growth and protect against hair fall. Third, I’ll provide you with a hair care recipe which you can begin using immediately so you can experience the positive benefits which almond oil has to offer. Almond, also referred to as prunus dulcis and prunus amygdalus, is a species of flowering tree with origins in the Middle East, the Indian Subcontinent, and North Africa. The flowers produced from the tree range in color from white to pale pink, and they bloom 7-8 months before the fruit of the tree (which we know as almonds) has matured. Omega-9 fatty acid, for example, contributes to cardiovascular health and improved blood lipids in Type-2 Diabetics, while omega-6 fatty acid is vital in its contributions to reproductive health and metabolism regulation. Additionally, omega-6 fatty acids have been shown to stimulate hair growth and contribute to the overall health of the skin and hair. While research is currently limited, almond oil and its variety of nutrients shows promise in treating various forms of alopecia. Two components of almond oil which cannot be overlooked are its flavonoids and phenolic acids. 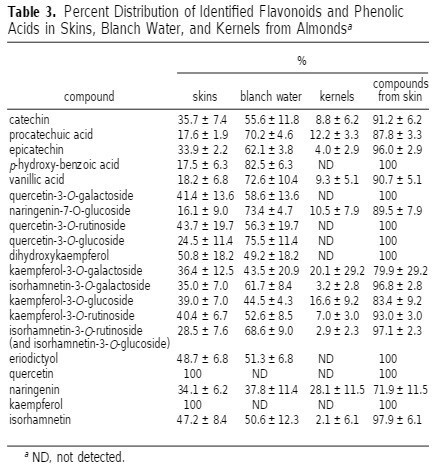 Both of these constituents make up a large percentage of almond oil, which is seen in the table below. What does this mean for your hair however? Both flavonoids and phenolic acids have been shown to have antioxidant properties. Antioxidants play a vital role in the slowing down of oxidative stress, and this can have a positive impact on individuals with AGA. 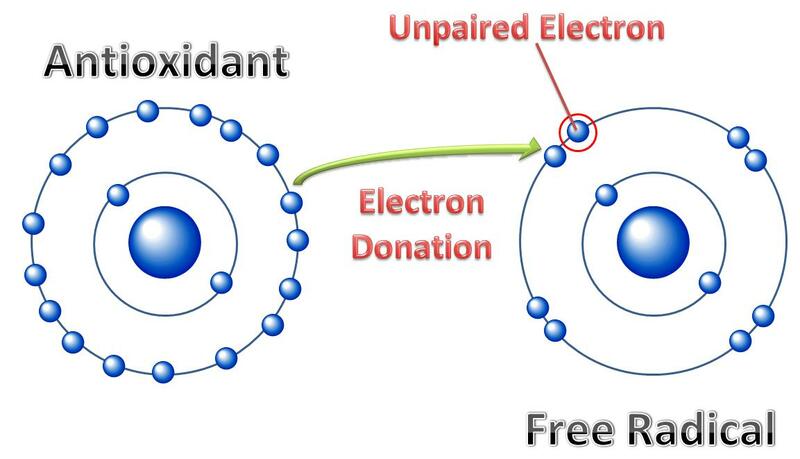 Illustration of an antioxidant donating an electron to the free radical, making it so the free radical does not steal molecules from the body’s essential cells. Oxidative stress is a process responsible for various signs of aging, including graying hair and thinning. Essentially, oxidative stress leads to an imbalance within the body between free radicals and antioxidants. 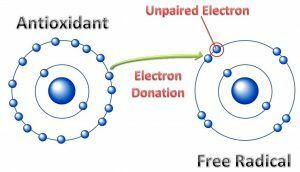 Free radicals are atoms which “steal” molecules from vital proteins and lipids, causing them to break down. Flavonoids and phenolic acids, however, playing the role of antioxidant, swoop in and save the day by ceasing the molecule-scavenging process. In individuals with AGA, supplementation with antioxidants can reduce the damage, such as inflammation and immune reactions, caused by oxidative stress. The phenolic compounds found abundantly in almond can have other positive effects, too, as seen in a 2014 research study which showed the effect that almond shell extract had on tinea capitis, also known as scalp ringworm. Scalp ringworm is the result of a fungal infection. This infection penetrates the hair shaft, leading to alopecia and is the number one cause of hair loss in children. After 6 months of symptoms (including itchiness, redness, inflammation, and hair loss), the 5-year-old patient received an antifungal compound which showed no effect on the infection. The shell extract of prunus dulcis was then applied, three times daily. Within 3 weeks, the patient had completely recovered from the infection, and without any adverse effects. Within a month of starting the treatment, the patient’s hair had regrown in the previously bald patch. This study just further illustrates almond oil’s antioxidant and antifungal properties. A Japanese research study looked at the impact that oleic acid and linoleic acid had on the inhibition of 5alpha-reductase, the enzyme which is known to convert testosterone to DHT. Individuals with androgenetic alopecia (AGA) have inherited a sensitivity to DHT. This sensitivity leads to the hair thinning and loss seen in patients with male-pattern baldness, and contributes to the miniaturization of hair follicles as illustrated below. Oleic and linoleic acids, however, both have strong inhibitory effects on 5alpha-reductase. This means that less DHT is produced within the body, leading to less hair follicle miniaturization and damage. Does this mean that those looking to use almond oil as a treatment will see results? Almond oil contains high levels of oleic acid, and to a lesser extent, linoleic acid. As inhibitors of DHT, there’s no doubt that the supplementation of almond oil will have a positive effect on those with alopecia. And, while there have been no human studies yet performed to show the beneficial effects of almond oil on hair growth, the study below does provide proof as to almond oil’s hair growth effects. As mentioned above, there are a variety of components found within almond oil which contribute to its hair growth abilities. 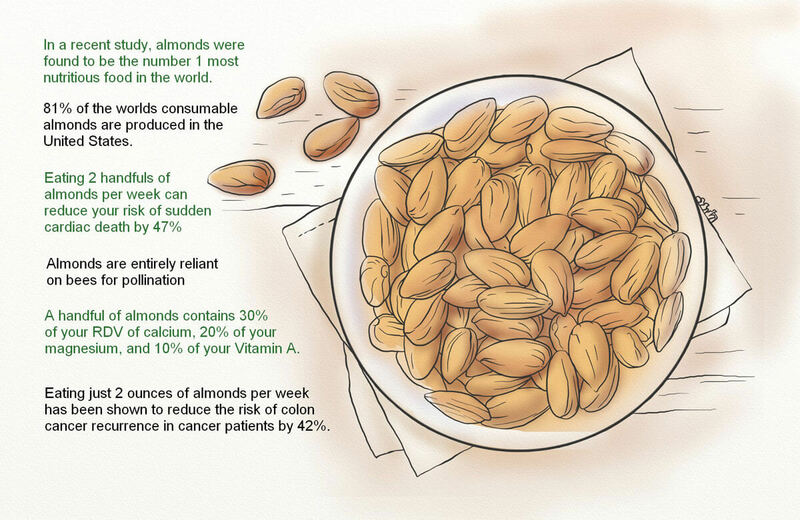 It does help, however, to see an in vivo example of almond oil in action. A 2009 research study sought to do just that, and it asked the simple question, does almond oil contribute to hair growth? The study consisted of 30 rats, all of which had a 3cm2 section of hair shaved from their dorsal region and an application of a commercial hair remover to ensure thorough removal. The rats were then split into six groups of five. The six groups were a) control; b) prunus dulcis (petroleum ether extract); c) prunus dulcis (methanol extract); d) prunus dulcis (chloroform extract); e) prunus dulcis (water extract); and f) minoxidil. The rats received one daily application of one of the above six treatments for a total of 30 days, and skin biopsies were taken at the 10-day, 20-day, and 30-day marks. The percentage of hair follicles in either anagen or telogen phase, as seen on days 10, 20, and 30 of treatment. Additionally, hair was plucked randomly from the backs of each rat on the 15th, 20th, 25th, and 30th days of treatment, and hair length was determined as mean length ± SEM of 25 hairs. A comparison of the six groups which shows hair length results on days 15, 20, 25, and 30. Ultimately, the researchers discovered that the petroleum ether extract of almond was most effective at converting hair follicles in the telogen (resting) phase to anagen (active growth) phase, and was also an effective promoter of hair length. In fact, the petroleum ether extract was just as effective as the minoxidil treatment! Find out more about how long Rogaine takes to work here. And, while the petroleum ether extract did perform more favorably, the three other extracts (methanol, chloroform, and water) did show themselves to be more effective than the control results. While researchers were unsure of the reason for the almond extract’s effectiveness, they hypothesized that an increase in the number of epithelial cells, located at the base of the follicle, were responsible for conversion from telogen to anagen phase, as well as a prolonged period of active growth. Can Almond Oil Be Used in Humans with Similar Results? 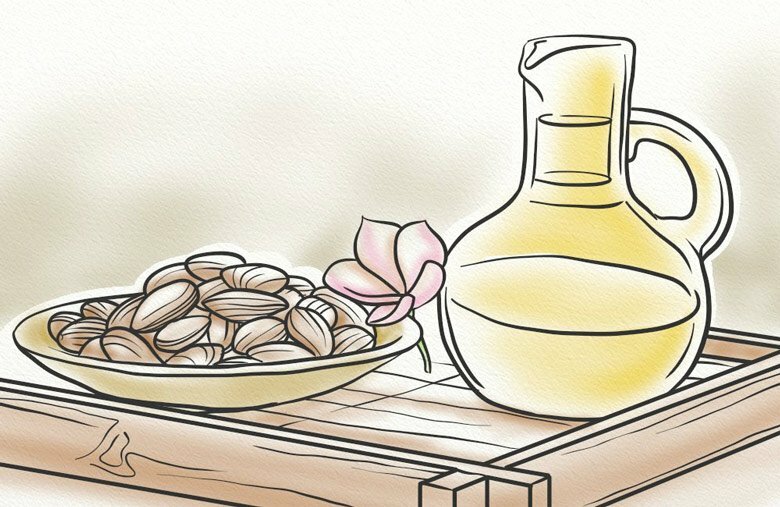 While there have yet to be any human studies done on the use of almond oil for treatment of alopecia, the results above do show promise and provide future researchers with a starting point. As members of the mammalian class, both human and rat hair growth cycles are similar. Both species experience the anagen (active), telogen (transition), and catagen (resting) phases of hair growth, and both experience hair loss for similar reasons. This means that the effects seen in scientific studies done on rats can, in at least some part, be assumed to be similar on humans. While there are certainly beneficial effects associated with oral consumption of almond oil, the most direct way to treat hair loss with the supplement is through application to the scalp. This can be done in a variety of ways, though for many, adding almond oil to shampoo can be the easiest manner. Combine all ingredients and take special care to mix thoroughly. 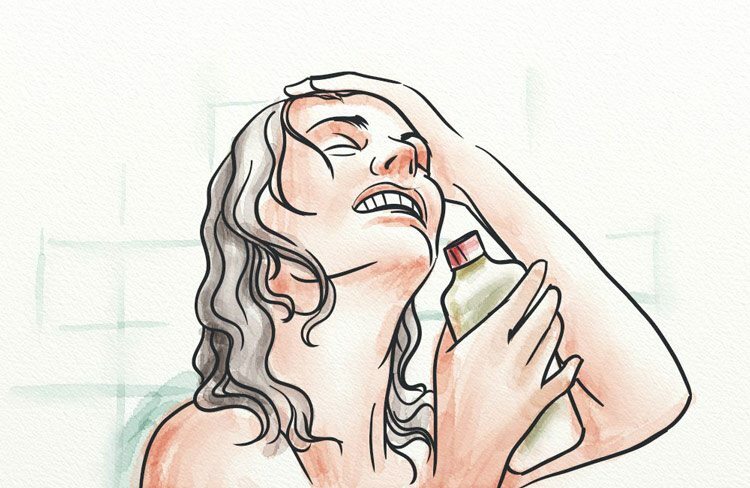 Now, with wet hair, work the shampoo into a lather, massaging into the hair and scalp until completely covered. Leave in for up to 3 minutes, and then rinse thoroughly with lukewarm water. This unique combination of ingredients contributes to hair growth and strength, and will protect the hair shaft from damage which may lead to brittle or dry hair. The liquid castile soap acts as a gentle cleansing agent, leaving your hair free from pollutants, hair product, and DHT buildup. The aloe vera balances the pH level of your scalp, promoting healthy hair growth. Olive oil, the main moisturizer within this recipe, hydrates the hair and penetrates the hair shaft, leaving you with strong, healthy locks. Of course, almond oil contributes to this shampoo’s hydrating effects, as well as fighting any microbials (such as fungus or bacteria) found on the scalp. Last, but not least, geranium essential oil has been shown to increase circulation to the scalp, delivering essential nutrients and promoting hair growth. Are There Side Effects Associated with Almond Oil Supplementation? As with any supplement, it’s best to approach use with caution and understand that no matter how rare side effects may be, they can still occur and in a variety of ways. As a culinary agent, almond oil is safe for human consumption, though you should limit the amount which you consume. Moderation, as they say, is key. For individuals with chronic conditions, or for women who are nursing or pregnant, consult with a medical professional before supplementing with almond oil. Drug interactions may occur as a result of almond oil’s variety of minerals and vitamins. While human research has yet to be done on the use of almond oil in the treatment of pattern baldness, preliminary studies done on rats do show almond oil to be an effective promoter of hair growth. Further, almond oil’s antioxidant and antimicrobial properties contribute to its use as a hair loss treatment, and may provide those with alopecia relief from DHT’s most common side effects, including inflammation, sensitivity, and hair follicle miniaturization. Is almond oil effective for those suffering from advanced alopecia? While its application may provide some relief, don’t expect almond oil supplementation to make a huge difference to your hair. For that you need to fix the underlying cause – then you can use almond oil to accelerate that new hair growth if you want to. I’m going to try this almond oil shampoo recipe although I may have to swap out some of the ingredients you mentioned. Hi Helen, yes it’s fine to swap some of the ingredients for others. If you’re interested in learning more I recommend you download my free ebook – Shampoo Secrets – which is full of amazing recipes for hair growth shampoos. I also show you which ingredients you should be using depending on your hair type.